(Daily Caller News Foundation) Republican Sen. Marco Rubio of Florida questioned Apple’s business intentions in China, arguing Wednesday that the U.S.-based corporation is being very hypocritical in order to gain entry into the world’s largest human market. Rubio said the dystopian irony of China — a country which was just given the dishonorable title of the worst abuser of internet freedom for a third year in a row — hosting the summit is just the proverbial tip of the iceberg. “The most confusing part of it all is that Apple CEO Tim Cook stood up at that conference and he celebrated China’s vision of an open internet. He delivered the keynote speech on the opening day of that gathering,” Rubio continued, adding that so did higher-ups at fellow American tech companies Google and Cisco. The impassioned lawmaker said Apple is openly capitulating to U.S.’s foreign adversary, all in the name of profits. What makes it worse, Rubio says, is that Apple and its leaders often “lecture us about free speech and human rights” and problems here in America. Rubio highlights how after China ordered tech companies operating (or wishing to operate) in the country to shut people off from virtual private networks (VPNs). The technological capability gives users the ability to navigate the web anonymously through an encrypted, secure connection. VPNs empower Chinese citizens with the ability to circumvent the country’s firewall (also known as the Great Firewall of China), which forbids people from accessing many online services and sites that are afford to much of the rest of the world. Apple reportedly agreed to remove more than 600 apps that offer VPN services, in which it is debatable whether it was out of acquiescence or obsequiousness. It also purged Skype, a popular communication service, from its app store specifically for China, according to The New York Times. 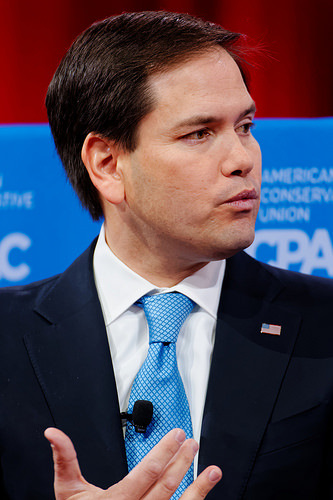 “So again, here’s an example of a company, in my view, so desperate to have access to the Chinese market place that they are willing to follow the laws of that country even if those laws run counter to what those companies’ own standards are supposed to be,” Rubio asserted. Rubio has been, at least to a certain extent, a stalwart for people and organizations with concerns that U.S. tech companies are doing whatever it takes to penetrate the Chinese market. He pressed a Facebook executive in early November on the tech corporation’s decision to remove the page of an exiled Chinese expatriate now residing in N.Y., while implying the act of censorship may have been carried out due to a desire to get into the massive foreign market.